One of the greatest “cultural treasures” in Quanzhou–in all of Fujian, really–is the Quanzhou Marionette Troupe, part of a Chinese marionette history that goes back 2,000 years. If you ever take a trip to Quanzhou, the Quanzhou Marionette Troupe’s training facility and performance hall is a “must” for your itinerary. These Marionettes are to Quanzhou as the Space Needle is to Seattle, as the Eiffel Tower is to Paris, as Gun Racks are to Pickup Trucks in Texas…. You have to understand, though, that this marionette art is far more than fancy puppetry. Some of the marionettes have up to 36 strings to manipulate, and they’re all important, but a master puppeteer can bring them to life. And I don’t mean just “making them walk like real people,” but making you feel that there are real emotions and unique personalities coming from each of the figures. And real, independent thoughts. Sometimes really evil independent thoughts. Like they remember some Opium War atrocity and are thinking of ways to exact their revenge on you. Anyway, in a follow-up post, I’ll take you on a tour of some of the marionette display cases and rooms, but here are a few other pictures from our visit to set the stage, so to speak. Next time: Meet the marionettes up close…. From the 1990’s to 2003 the author followed four marionette theatre companies in the Quanzhou area. Based on this unique fieldwork the author describes both the theatrical and social context of the marionette theatre. He shows it as a complex entity in which elements of religion, ritual, language, history and social structure all come together. The study includes an analysis of the companies’ organization, libretti, music and puppets, as well as of the social and religous context of the performances and their ritual aspects. Its important insights into the functioning of a traditional form of theatre in the economically advanced region of southern Fujian provide a fascinating window on contemporary China. 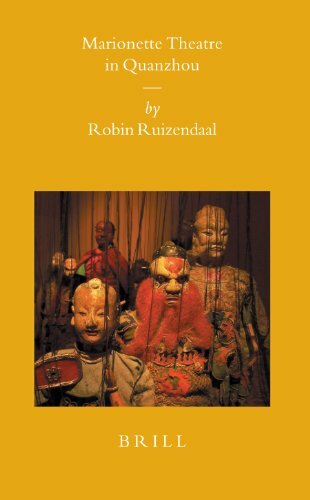 Robin E. Ruizendaal, Ph.D. (1999) in Sinology, Leiden University, is director of the Lin Liu-Hsin Puppet Theatre Museum in Taipei, Taiwan. He has published extensively on Asian puppet theatre.